Imagine living in a rented room with no running water or electricity in one of the most crowded slums of Delhi! Asma and her family, which includes her mother and father and her two other siblings, live in such conditions just a short walk from the Tigri HOPE School. Asma’s father makes only a few hundred rupees selling fruit when the weather is good and her mother stays at home to take care of the house and children. Her father and mother moved to the slum twenty years ago to look for better job opportunities. 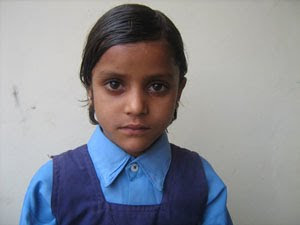 Asma’s parents send Asma and her brothers to the HOPE School so that they would have better opportunities in life. They believe that with the help of the staff and the variety of the subjects that their children learn they will grow up to be successful individuals. Asma notices and appreciates the hard work and effort of her parents in order to support the family. However, she realizes the struggle her parents must endure, and she knows she would not like that for her future. One of her favorite memories from the HOPE School is when she learned a dance routine. She also enjoys the school because she knows that the things that she learns now will help her in the future. Asma is 7 years old and in the kindergarten. She is a brilliant student.